This past weekend, we lost someone who is truly irreplaceable. How does one capture in a short and single tribute the contributions of Bill Cook to the world of drum corps? It's practically an impossible task. The man did so much for drum corps, and so much of that was behind-the-scenes—the way he liked his contributions to be. 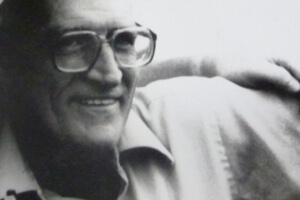 In the early 1990s, he almost single-handedly pushed Drum Corps International to computerize its operations, supplying equipment and programmers from his own company for an extended period. Over several seasons, he provided sponsorship for the World Championship broadcast on PBS; although it's unlikely people would run out to buy a Cook coronary catheter because they saw the name in the credits of the broadcast. Despite Bill's reticence to claim credit for any of his contributions, he wasn't above standing out in a crowd in unique ways. During Star of Indiana's "Belshazzar's Feast" year of 1990, he showed up at competitions dressed in full regalia as a robed King Belshazzar. He wore a top hat with a giant joker card sticking out of the hatband in 1985 and for the corps' patriotic show in 1992 he wore an Uncle Sam outfit. Those costumes, perhaps, sum up his character more than anything. A consummate joker, he was always throwing people off guard by his candor and his rather strange wit. No one expected an icon of industry to be so, well, Bill Cook-like. But, as many people know, anyone with a healthy sense of humor is also likely to be very, very serious about his mission in life. When Star of Indiana was conceived in the mid-1980s, it was hoped the corps would make the DCI World Championship Finals sometime down the road. But the corps finished the season in 10th place and never looked back. Bill said that he and corps director Jim Mason started the corps by "selling air," promoting an entity that as-of-yet was nothing more than an idea with an abandoned school building for a headquarters. 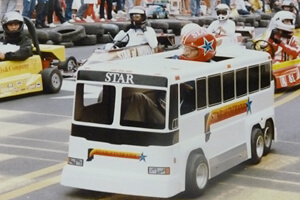 From the beginning, Bill wanted Star to be self-supporting, and so the corps started leasing its buses when it wasn't touring. Then it started leasing other corps' buses as well, providing an off-season income stream for corps that would not have had the extra income otherwise. Buses upon buses were added to the charter fleet, and the corps found itself the proprietor of a very successful year-round operation. Star of Indiana through the years. 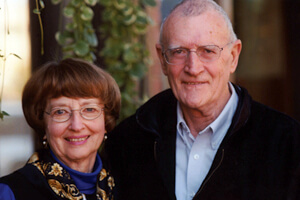 Bill Cook with his wife Gayle. That icon of industry never lost touch with his roots. An entire business empire was built upon a personal estate consisting of a Chevrolet Corvair and a small apartment that doubled as his first factory. Oh, and a $1,500 loan in 1963 that Bill confided he was concerned about being able to repay. Whenever anyone called to place an order for the new-fangled contraptions known as coronary catheters, his wife Gayle would close the door so the clients wouldn't hear their baby Carl cry. That baby grew up to march as a member of the Colts which introduced Bill to the wonders of drum corps. Years later, with companies spanning the globe that employed 10,000, he still drove himself to work and ate in the company cafeteria, where all the employees knew him by the name he insisted his drum corps compatriots call him; "Bill." It will never be known how many lives he indirectly saved through his contributions to the health care field. He was the first person to commercially produce coronary catheters for angioplasty in an era when the few doctors who understood the Swedish process were attempting to make their own devices for each individual procedure. He didn't need drum corps to be a complete human, but he wanted to be part of the activity because he loved it. And so he became a household name in the drum corps community, although he likely would have preferred to being regarded as a bit player. When he spoke, people listened. Directors realized through paying attention to him that it was possible to run their corps as a business, and that by doing so, they would help prolong the lives of their own units. To this end, the directors utilized Bill as DCI's financial consultant. Mini Grand Prix fundraiser in Bloomington, Ind. Bill's tenure inside the drum corps community was all too brief. There's no doubt that many thought Bill would disappear from the marching activity and fade back into obscurity when Star left the competition field after the 1993 season. But three seasons of the group's stage production "Brass Theatre" was just a prelude to something great and unexpected. In 1999, word got out that he was up to something totally off-the-wall and very, very big. Somehow, he and former Star of Indiana director Jim Mason had convinced a number of performers that they were on to something bold and wonderful, something that would alter one's perception of drum corps, and, if successful, would ultimately introduce untold hundreds of thousands to the activity for the first time. The theatre production "Blast!" hit London like a second Blitzkrieg, and then grabbed Broadway around the throat, walking off with a Tony Award. And there was Bill, up on stage, accepting the award and likely inspiring many to think, "Damn, he's done it again." Bill's contributions to drum corps are widely known only to a few. It's part of the mystique he took pride (and fun) in cultivating. We are a better activity for having been blessed with his presence, as short as it might have been. And we're a better activity for relishing in the spotlight that "Blast!" focused upon the entire marching community, introducing many to the marching arts for the first time, further confirming the awesomeness of the drum corps experience for others. One cannot capture in a short and single tribute the contributions of Bill Cook to the world of drum corps. But one can sure have fun trying. Read "Our friend Bill, Personal memories of Star of Indiana founder Bill Cook" Read a personal history of the Star of Indiana written by Cook at StarOfIndiana.com.